Okay, I have slacked off in the last couple of weeks. 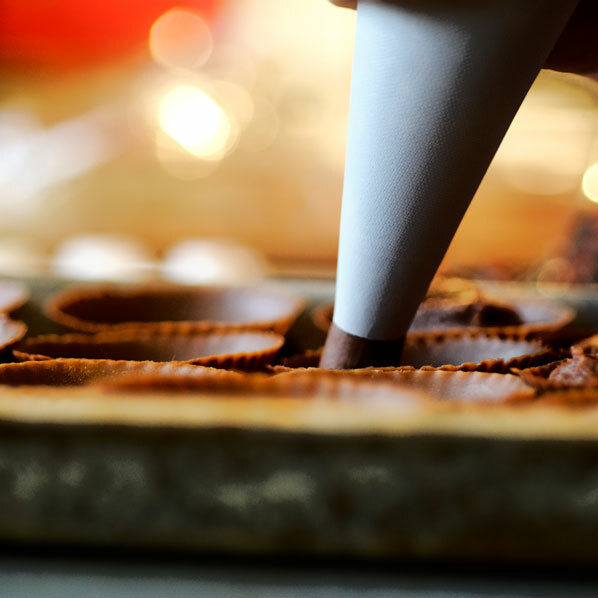 Instead of applying myself to acquiring new chocolate skills, I have been playing around with hot chocolate and s’mores, and EATING more of the stuff, which keeps appearing in various forms, backstage at the show I am performing in – well, it IS a Christmas show – than learning how to produce new, beautiful chocolate creations. But I have been promising my family, and the cast and crew of the show, some new experiments to taste. So now, back to my Ecole Chocolat homework. Ahh. Yes. Simple ingredients. Plenty of technique and timing required. High probability for sticky, sugary disaster. Sounds like the perfect activity for a rainy day, in the week before Christmas, when I have numerous two-show days. I’ve had a great curiosity to see how I could incorporate a beautiful strawberry puree I have been making for years, into chocolate centres. Strawberry has always been a favourite of mine, along with lemon, for their fresh flavours, and if I am going to venture into untried chocolate creation territory (for me, anyway), I need an old delicious, reliable friend along for the ride. I read the technique lesson on how to make fondant, and realize it is a wonderful “carrier” for another old favourite of mine – peppermint. The thought of peppermint patties, enrobed in bittersweet chocolate is the spur I need to get me reaching for my apron. I study the photographs, and re-read the instructions until I have them committed to memory. It seems that this is another technique where timing, fast manipulation and temperature are critical, and I want to have everything within arm’s reach, as a visual prompt, before I begin. I lay out my work station, making sure the indispensible marble slab is close at hand, two candy thermometers ready (one clipped to the side of the pot and one with a probe), as it is of major importance not to get the temperature of the fondant over 234 degrees F, favourite silicon spatula, scrapers, a heavy bottomed pan holding: sugar, white corn syrup and water. These are the only ingredients this basic fondant will contain – no possibility for hiding behind complex flavours here. If I screw it up, I’ll know, and no amount of chocolate coating will save it. I am humming as I go through this ritual. It is calming and centering and makes me feel like I am actually an organized person. I should mention, at this point, that I am fortunate enough to have a helper this week. My mother-in-law is staying with us for Christmas, and, dear, hard working person that she is, has eagerly volunteered to be my sous chef for this process. Which is a fortunate thing, as it turns out some muscle will be required to knead this stuff, once it starts to set up. The initial process is very simple and straightforward, and as the family comes in and out of the kitchen to chat, we continually check the thermometer. Once the sugar has completely dissolved and a rapid boil has been reached, it takes no time for the desired temperature to be reached, and it’s “go time”. With a bowl of clean water standing by, for the scrapers and our hands, we sprinkle the marble slab, and pour the sugar syrup from the pot in one slow even stream, careful not to scrape anything from the sides or bottom. It soon becomes warm to a finger touch, and leaves a satisfying, noticeable dent. Great fun to poke at, until I am gently reminded that I should probably start scraping the mass. It is already difficult to work and requires a great deal of muscles power, to bring it into the centre, fold it on itself, and spread out into a figure eight pattern. We are both small women, it is a testament to our upper body strength that we push this stuff around and around, and get it to the point where it starts to go from clear to opaque. My valiant Mum-in-law, who is French Canadian, remarks that this is just like making La Tire Ste-Catherine or St Catherine’s Day Taffy. Apparently, St. Catherine, among her many other claims to fame, is the patron saint of unmarried women. On her feast day (November 25), it became a tradition in New France (Quebec), from an idea of Marguerite Bourgeois, a teaching sister in the new colony, for the unmarried women (Old Maids, over 25 years!) 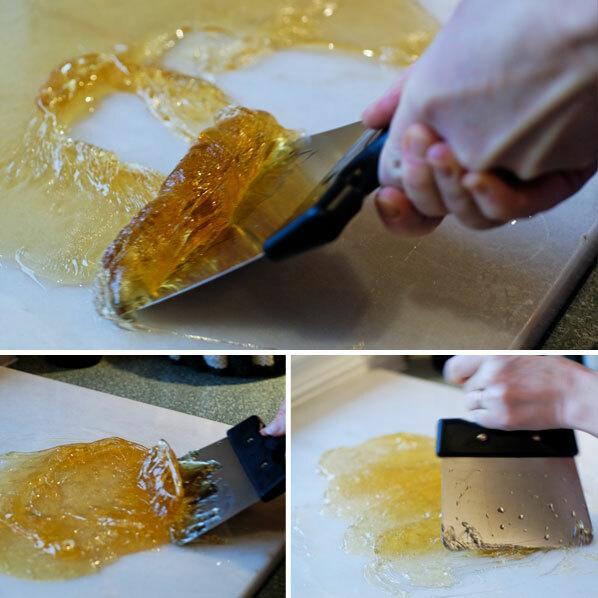 to make pulled taffy, to offer to and attract marriageable men. For a more comprehensive description of the history of, and recipe for this taffy, please have a look here. 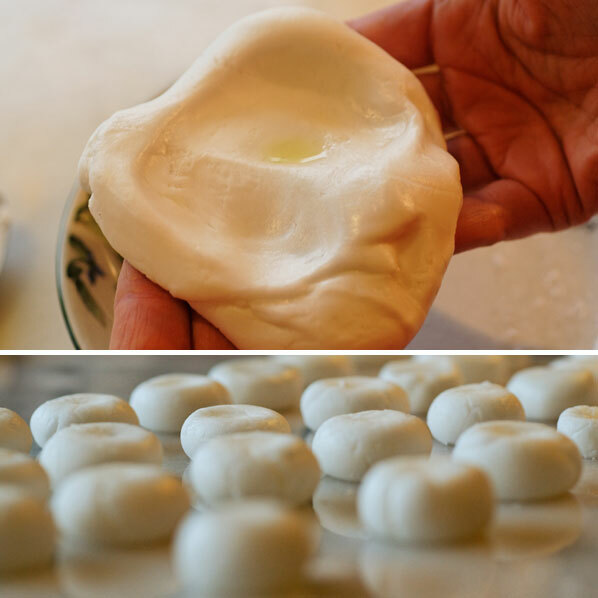 I can understand how watching someone make this taffy might attract someone else looking for a strong helpmate to work a farm, if it is anything like working this fondant. 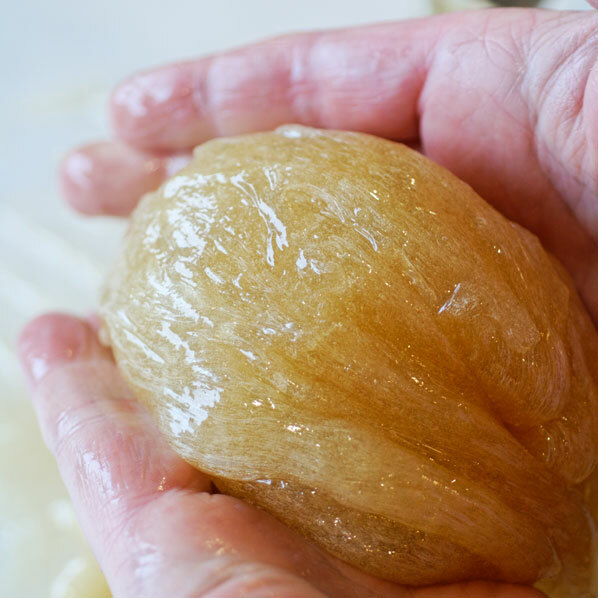 It is a show of strength to knead this stuff into a smooth and lump-free ball. But it does come together, and looks wonderful. Shiny smooth, and ready to ripen for 12 hours, before we can add in the flavourings I am so looking forward to trying. We feel justifiably proud, and flex our muscles in satisfaction. We used white corn syrup in this initial test. Buoyed by its apparent success (and perhaps as an homage to those strong French Canadian ancestral sisters), we follow it up with another batch, made with light corn syrup. I am interested to see how the taste will differ, and affect the added flavourings. 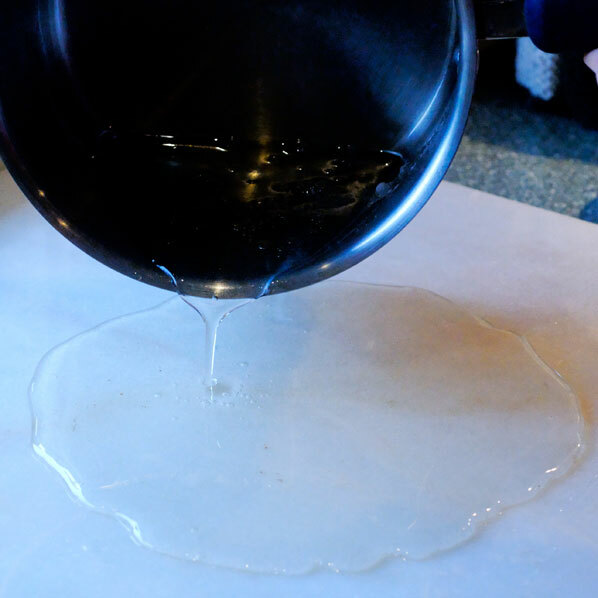 The fondant can also be made with lemon juice or cream of tartar, and I will try these in subsequent batches. This second batch proves more problematic, perhaps because I was worried about letting it boil even a second too long. It did not begin to set up quickly, and my intrepid sous chef and I scraped the whole thing back into the pot, and bravely put it back on the boil for another few minutes. This time it did set up, but very rapidly, and it was only with her vigorous kneading that all the lumps were worked out. Sucess! The fondant has ripened, been flavoured, and is ready for using as filling. The next day, and running late as usual, I have quickly molded some of my Mum’s “wee chocolate cups”, to test theses fondant fillings and also to test a milk chocolate/strawberry ganache, made with the my favourite puree. They look very pretty, and as they are destined for the between-shows potluck today, at the Arts Club Theatre, I have no doubt will not last long. Theatre folk love to eat. It feels like this venture into fondant making has been a real family affair: a partnership between myself, my Mum (and her wonderful, ubiquitous wee chocolate cups), and my tiny, fearlessly strong mother-in-law. And all those fabulous women who went before us: St. Catherine and the strong, unmarried sistahs.